OM3 LC LC Armored Duplex Fiber Patch Cables 10G Multimode 50/125 MMF. OM3 LC LC Armored Duplex Fiber Patch Cables, 10Gb Multimode 50/125 Corning optical fiber cord. Terminated with small form factor (SFF) ceramic ferrule LC connectors, high bandwidth 10Gbps multimode fiber patch cables for high speed, low loss, data transmission. Inside the crush resistant armored wrap is an OFNR, Aqua colored, 2.0mm outer diameter, PVC fiber jumper with zip-cord. OM3 LC LC Armored Duplex Fiber Patch Cable, 10Gb Multimode 50/125 Corning optical fiber cord. Protect your install with Crush and Rodent resistant armored fiber optic patch cables. This 10 Gb/s, transmission fiber optic patch cable is terminated with precision ceramic ferrule SFF (Small Form Factor) LC connectors (including duplex LC clips) for compact, high cable density environments. 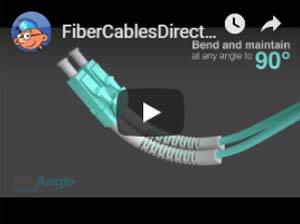 A well protected, durable fiber optical assembly for your high speed fiber optic network needs. Armor wrapped aqua colored, 2.0mm outer diameter, OFNR riser rated PVC jacket. Typically used for vertical pathways, shafts, and spaces between building floors. Each armored fiber optic patch cable ordered from FiberCablesDirect is individually tested and bagged with test results inside. We also provide a Lifetime warranty on all our products. 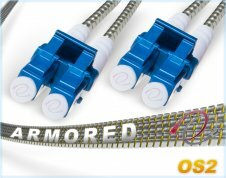 Orders for Armored Om3 Lc Lc 40/100g 50/125 multimode duplex cables may require an additional 1 to 2 days to ship if out of stock. However, in-stock orders ship within 24 hours or less, usually orders ship within hours of being placed. Lengths available in our online catalog for Armored Om3 Lc Lc Duplex fiber optic cables 100gb multimode 50/125: 3 Meter, 5 Meter, 7 Meter, 10 Meter, 15 Meter, 20 Meter, 25 Meter, 30 Meter, 40 Meter, 50 Meter, 60 Meter, 70 Meter, 80 Meter, 90 Meter, 100 Meter. Fiber Cable Direct head exactly what I needed to complete my project. The armor protected cable should handle the possibility of foot traffic.